By Dan Ambrose: Light welterweight contender Lucas Martin Matthysse (28-1, 26 KO’s) has got to be feeling pretty confident that he can stop former IBF/WBC light welterweight champion Devon Alexander (21-1, 13 KO’s) in order to fight Alexander on June 25 in his home city at the Family Arena, in Saint Charles, Missouri. It takes a lot of guts to come all the way over from Argentina to face Alexander at home, because we recently saw Alexander win a controversial 12 round decision over former WBA light welterweight champion Andriy Kotelnik while fighting in St. Louis, and it may take an especially good performance from Matthysse in order to get the judges to lean in his favor to get the win over the home town Alexander. 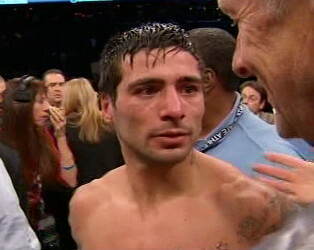 Matthysse may just be putting pressure on himself to where he might actually need to knock Alexander out to get the victory, because if the fight is even somewhat close, you can bet that Alexander will get the win. But there is also pressure on Alexander, because if struggles again and looks as horrible as he’s looked in his last two fights against Kotelnik and WBO light welterweight champion Timothy Bradley, fans will be deserting Alexander like rats fleeing from a sinking ship. You can’t make a career out of winning questionable decisions over and over again while fighting at home. For Alexander, if he wins this, he’s going to do it in an impressive fashion to make up for the fights against Kotelnik and his 10th round technical decision loss to Bradley last January. A lot of boxing fans think that Alexander quit in that fight, as he didn’t look like he wanted the fight to continue after clashing heads with Bradley in the 10th. It wouldn’t have been such a big deal if Alexander was dominating the fight, but he wasn’t. Bradley was wearing Alexander down on the inside and things looked bleak for Alexander at that point with only two rounds to go.